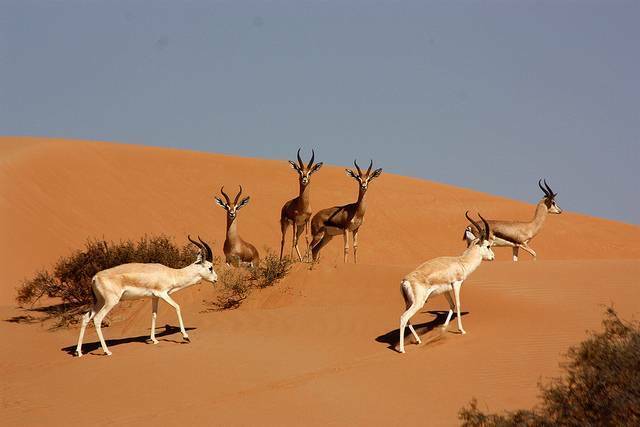 Dubai Desert Conservation Reserve is the classic destination point in the city that beckons every traveler. This long stretch of desert, which is an hour drive from Dubai, is the first National Park in the UAE. This desert was once a camel farm until 1997 when Sheik Mohammed Bin Rashid Al Maktoun bought the land and transformed it into a haven for many indigenous species. Arabian gazelle, San gazelle, Ethiopian hedgehogs etc., can be spotted. Keep a full day for the touring of this beautiful desert which has a lot more fun activities to offer. The guided tours are sponsored by the four concession holders, Arabian Adventures, Lama Tours, Trarco, Alpha Tours or the desert can be visited by staying at the hotel. The tours start from your place of stay and drive to the heart of the desert. Camel rides, horse rides, 4 wheeler rides, sand dunes, belly dance, private desert dinner, activities like archery, falconry, sand boarding which will make your experience memorable. The history and significance of falcons in the Arab country is explained by the guide. Note that the sand bashing Jeep ride will be a bumpy one. The best part of the tour is the dinner under the stars on the pristine sands whilst enjoying the belly dance. Sunsets are best enjoyed here which complements the beauty of pristine golden sands.